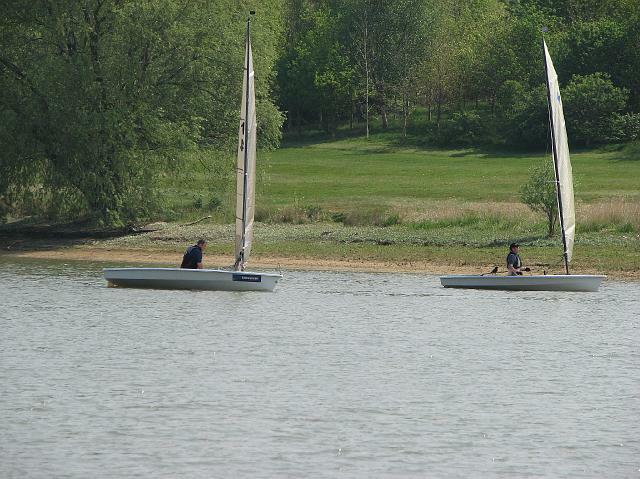 A combined Open meeting for the Phantom and Snipe classes was held at Stone Sailing Club over the weekend of 17th 18th June. In complete contrast to the previous weekends event at Creeksea on the River Crouch, the River Blackwater appeared devoid of wind when the fleet arrived for an 11am briefing on Saturday morning. The Maldon Barge race was in progress with barges and various smacks drifting out on the tide making a fine picture on a glassy sea. All very picturesque but it was no surprise to hear the two hour postponement of the planned 12:30 start time. 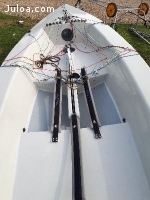 This delay allowed the fleet to indulge in several of their favourite pastimes, with small groups of sailors clustered around new boats generally fiddling with string and offering helpful tuning suggestions. In all such situations it is not unusual for control line splicing sessions to develop and this activity spread around the fleet. It was fortunate that a "mystery sailor" from Northampton was there to lend advice and assistance with knowledge gleaned from his past incarnation as a Marlow ropes representative. In fact the need to undertake similar works on the sadly neglected borrowed boat that he was proposing to sail soon became apparent and time flew by in a flurry of dyneema. Relieved by occasional tea and Haribo sweets, the fleet soon finished the macrame lessons and resumed the banter and tales of glories past. After two hours it seemed certain that the land breeze/sea breeze battle was a dead heat - and heat was the word - as the temperature continue to rise and red faced sailors retreated to the club house. A further two hour delay was therefore no surprise. Racing did however eventually start at 4:30 with three races planned to be sailed back-to-back over an Olympic triangle/sausage course using the club line and fixed marks. The breeze had settled to a steady(ish) South Easterly and the tide had begun to flood. The barges had been seen to pirouette their way back up river leaving the Blackwater free for racing. Starting inshore Chris Roberts rounded the windward mark ahead of Phil Longley of the host club and headed off downwind. Longley took a higher course to the wing mark and Roberts realised that he had been mistaken in his mark identification and headed for the correct mark before gybing and heading to the leeward mark towards Marconi. The beat back through the club line was a single tack affair but presented several choices. Staying inshore out of the tide seemed sensible but a spit of land running out to the club moorings accelerated the tidal flow and there seemed to be more breeze further out in the river. Creeksea sailor Bill Taylor saw the opportunity and sailed a great race to make the best of this option. The final windward leeward leg saw minor place changing with Roberts having pulled well ahead of the fleet to take the win, followed by Longley and Roger Smith. Starting promptly after the last Snipe had finished and again Roberts got to the windward mark in first place ahead of "mystery sailor" and Roger Smith. Having split gybes at the mark "mystery sailor" and Smith overtook Roberts on the run and gybes smartly around the wing mark to reach up river. Rounding the mark in an almost overlapped position these two seemed undecided whether to hold on to the tack and head inshore or tack immediately. The sight of the mark seemingly motoring ahead probably made the decision to immediately tack a little easier and the tricky beat downriver began. Roberts managed to overhaul Smith on the beat but "mystery sailor" held the lead to the windward mark and headed off down tide to the leeward mark. On the reach Roberts kept to a higher course through the moorings to round the leeward mark in first place and pull ahead on the final beat. Roger Smith took third after a close battle with the Northampton enigma. The third race of the day was abandoned as it was now almost 6:30 and the club catering was in full swing. With an even lighter wind forecast for Sunday and similar conditions evident on the day, it was no surprise that after two postponements the racing was abandoned and the two completed races counted. The event was therefore won by Roberts with two wins, ahead of Phil Longley and Roger Smith. After far too many years of trying and many second places, Roberts concluded at the prizegiving that if he was to win a Phantom Open meeting anywhere then there was no better club to do it than at Stone sailing club - apart from Creeksea of course! 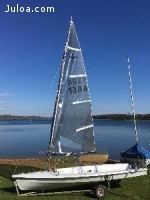 Special mention should be made of Stewart Legrove from Stone Sailing club who was sailing his beautifully restored boat "Manta" 349, who proved that old woodies can hang on to the skirts of their lighter epoxy sisters! The next event in the Eastern Series is at Waveney and Oulton Broad on Saturday 22nd July.